Renowned Malayalam writer Ashita passed away aged 63 in Thrissur, owing to a long battle with cancer. She is survived by her husband KV Ramankutty and daughter Uma Praseeda. Born on April 5th, 1956 in Thrissur, she did her schooling in Delhi and Bombay. A post graduate in English literature, from Maharajas College Ernakulam, she had expressed her interest in learning Economics in one of her memoirs. 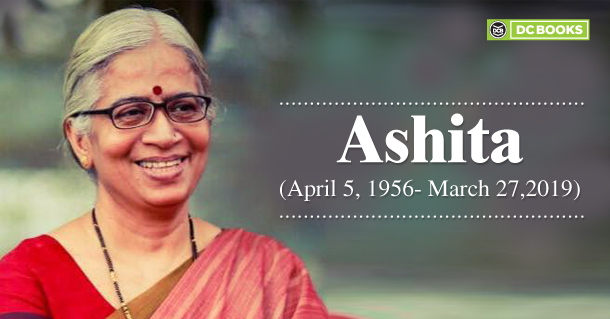 Known for her short stories and poems, Ashita made us believe in the beauty of things that are small and beautiful. She has written as many as twenty books which include the collection of short stories, poems, and children’s literature. The refreshing themes made her texts standout, of which the notable ones are ‘Vismaya Chhihnangal,’ ‘Apoorna Viramangal,’ ‘Ashithayude Kathakal’, ‘Mazhameghangal‘ and the recently published ‘Ashithayude Haiku Kavithakal’. She is also the recipient of several awards including Edaserri Award in 1986 and the Lalithambika Antharjanam Award in 1994 and Padmarajan award in 2000 for Thathagatha. The philosophy that she had permeated her writings with, is here to stay with us and she will be remembered for the voice she rendered to Malayalam literature.